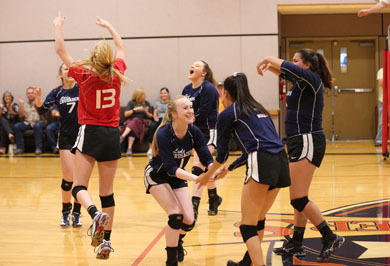 The Varsity Volleyball team returned to the TAPPS State Final Four tournament for the 3rd straight year, after going undefeated in District Play. 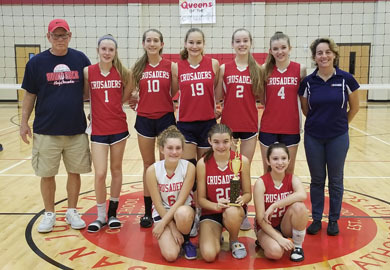 Congratulations on a great season Lady Crusaders! 2017 TAPPS 3A STATe champions!!! The 2017 Varsity volleyball team has done it again! After arriving at the TAPPS state tournament in Waco on Friday, the Lady Crusaders defeated district rival CTCS in the semi-finals and polished off Willow Park Trinity in the championship game with a decisive 3-1 victory! Congratulations to the varsity volleyball team! You have been an outstanding representation of Christ and CRU!!! 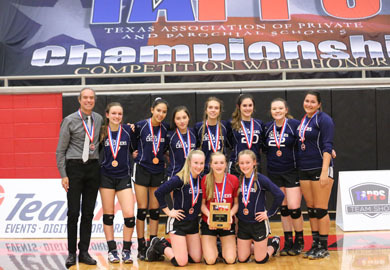 The Varsity team is coached by Doug Keyser, who has many years of coaching experience with top levels clubs in the Austin area and has been coaching at RRCA since 2012. 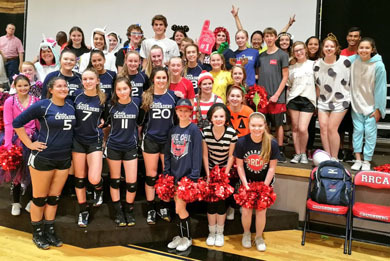 The Varsity and JV teams compete in the Texas Assocation of Private and Parochial Schools (TAPPS) 3A district, while the elementary and middle school teams compete in the Capitol Area Private and Parochial Schools (CAPPS) league. The girls at all levels work on skill building, teamwork, the value of hard work, and encouraging others to strive for their best on and off the court. Elementary and junior high students enjoyed a fun week at the RRCA Volleyball Summer Camps. In addition to working on the fundamental skills of overhand serving, passing, setting, and hitting, the athletes ended each day with fast-paced game play. (Zombie Apocalypse was a player favorite!) The camps were a great way to prepare for the upcoming school season. It's exciting to see so many of our students getting involved with our volleyball program! 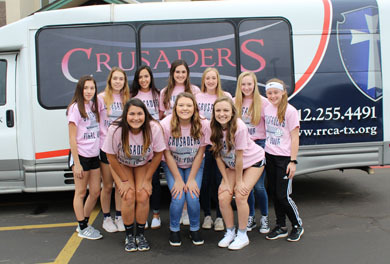 The Lady Crusaders were undefeated in Distict play and advanced all the way to the State Final Four! RRCA faced off against Central Texas Christian School in the State 3A semi-final match and won 3-0. On Friday, November 4 they faced Rockwall Heritage in the State Championship. The team played well and lost in the championship to end the season as State Runner up.